The Children’s Clinic recently raffled off a beautiful handmade quilt made by Kathy Woodley from Degembris Farmhouse and we raised over £130. Many thanks to Kathy for her lovely quilt. Degembris Farmhouse raised £1000 for the charity by holding their Big Breakfast and served a whopping 154 breakfasts in one day. We are very grateful as this is not the first time they have raised money for us. Lost in Song held 4 events throughout August along the river and at the first one our charity was chosen to “rattle” buckets. We managed to raise over £200 from the generous people of Lostwithiel! Our sincere appreciation goes to the people of Lostwithiel and to Lost in Song. Demand for our complementary therapies of cranial osteopathy and paediatric acupuncture continues to rise as more and more babies and children come for treatment. Last winter’s wet weather made two of our practice rooms in the old part of the building extremely damp and unusable for quite a while. Building surveyors told us that we needed to slate the outside wall and dry line the inside walls. The estimated cost was £25,000 – a lot of money for a small charity but luckily, our friends and volunteers have come up trumps. We are exceedingly grateful to the Clare Milne Trust who have given us £10,000, also a private donor, who wishes to remain anonymous, who gave us £9,000, the Duchy Health Charity who gave us £3,000, the Fowey River Lions who have given us a £500 donation, the Tintagel Orpheus Male Voice Choir who donated £500. The Fisherman’s Arms at Golant donated £110 from their Quiz Nights, the Corby family held an open garden day and raised over £700, our Sponsor a Slate has raised well over £600 – our Trustee, Vicki Hibbs has held a sponsored run and sponsorship money continues to come in. The building repairs have now been completed. Without everyone’s help, we would not have been able to carry out these renovations – A very BIG THANK YOU to one and all. Come and see what we’ve done – we are now fully prepared for the busy winter ahead. We had our AGM at the Clinic on March 10th 2014, and one thing we discussed was our fundraising efforts over the past 12 months and all the donations the Children’s Clinic received. We would like to say a massive THANK YOU to everyone who has chosen to support Children’s Clinic for Cornwall, enabling us to subsidise treatment for children. We have been given nearly £1000 from Degembris Big Breakfast, £1,000 from the Marris Trust, £400 from the Howarth Family, £200 from the Lerryn Yoga Group, and over £100 from Maria Hamley Allan. L Hudson has also given the Clinic over £100 and we have received £100 from the Lostwithiel Ladies Group and £50 from Menheniot Women’s Institute. Dr. Hannah Bowen’s coffee morning raised over £200 and a further £50 has come from local donation boxes. We are a charity which relies on local support to keep us up and running, so THANK YOU, it is all very much appreciated. If you would like to hold a coffee morning to raise money for the Children’s Clinic, we will be able to subsidise even more children’s treatments. Get in touch with the Clinic by phone 01208 872867 or email us through our contact page. CAR BOOT SALE of Books and DVDs – We raised £106.60 on Sunday, 21st April, 2013 at Par. Many thanks to everyone who inundated us with books and DVDs! Cold work but worth it. FUNDRAISING UPDATE – 24th April, 2013 – A very kind donor who wishes to remain anonymous has given the Clinic a cheque for £500. This will help towards the cost replacing the window broken by the thieves in March and also goes towards subsidising treatments for children. People have been so generous – the Fish and Chip Shop in Lostwithiel has given us £50, and we have received another £100 from another donor, and some smaller donations of £10s and £20s. People were horrified at the break-in and have been overwhelmingly generous in coming forward to help us. All of us at the Clinic is so appreciative of their help – a big thank you to everyone. Patients and staff at the Children Clinic for Cornwall were horrified after a callous break-in and theft at their Lostwithiel premises. Some time between 7 pm on the night of Thursday, 7th March, and 8.30 a.m. the following morning a double-glazed window and frame were destroyed and petty cash stolen from the Clinic in the Market Square. That’s how the clinic originally came into being: to offer non-conventional treatments by experienced practitioners with specific paediatric training to all children, regardless of their family’s income. We also treat adults as well, for a really wide range of conditions and it’s a lovely clinic, supported by local volunteers and really valued by those who use it. It is believed between £15 and £20 was taken. 2010 There have been some great fundraising events over the spring and winter – here are just some of them: Sarah Jane King, artist and jeweller in Tremar Coombe, Liskeard, opened her studio for a week in June, and as a great supporter of Kate Hands and the Clinic, donated £70 to us. Many many thanks from us all. Our heartfelt thanks to Jazmine Wileman raised over £170 for the Children’s Clinic by creating and producing an evening of dance at Truro School. The Degembris Farm Big Breakfast – Kathy Woodley and Hannah Elford together made over 100 breakfasts on the 12th March which made £400 for the Children’s Clinic – a very big thank you from everyone at the Clinic. The fashion show in Lanlivery organised by Rosemary Truscott made £200 – well done Rosemary. And thank you to Emily Kidd of Emily’s Cakes who donated £100 at Christmas – over and above the 15% from the sales of her cakes. Our thanks too to Beth Charles who made £50 with a table top sale in the Lostwithiel Scout Hut, Looe Lions – once again, the Lions have come up trumps and have given us £250 to go towards extending the central heating into the rooms in the old part of the building. After this cold winter, a much-needed improvement which has now been completed. So a big thank you to Looe Lions. All of us involved with the Clinic are very very grateful for your help and support. Our thanks to you all. 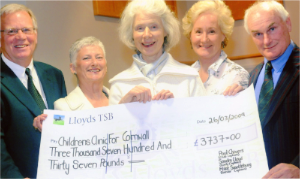 March 2009 We were presented with a very large cheque for £3,757 in front of the members of the Lanhydrock Golf Club on Thursday, 26th March. The Club Captains, Paul Chivers the Club Captain, Sandra Lloyd the Ladies Captain, and Mike Scantlebury the Seniors Captain, joined forces this year to make us their Charity of the Year and have run many events to raise money for the Children’s Clinic. Kate Hands, the Clinic’s Principal, and Lizzie Morgan, trustee and fundraiser, were on hand to collect the cheque and all of us connected to the Children’s Clinic thank the members of the golf club for their tremendous support. Sandra Lloyd, the Ladies Captain, said “It’s great to support a small local charity which does such good work helping local children and have fun at the same time”. A heartfelt thank you from all of us at the Clinic. February 2009 Our fundraising efforts over the winter have brought in several more very generous donations from the Clare Milne Trust, the Tanner Trust, and just this month a very welcome donation from the Garfield Weston Foundation. We are very grateful for this support, especially as now the building work is finished we can concentrate on providing even more subsidised treatments to the disadvantaged children of Cornwall.